Your family ancestry is brought to life with this gift set on premium parchment paper. 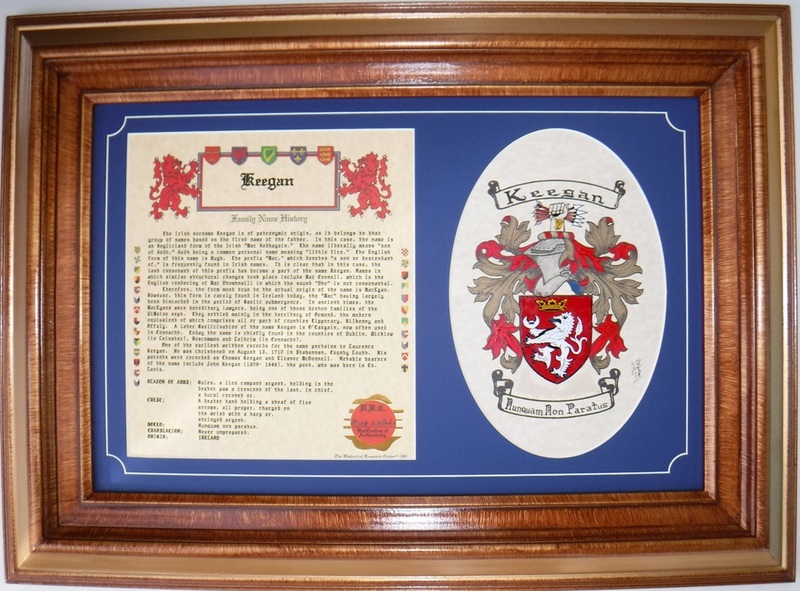 Within one custom frame [16”h x 23”w], your family name history is displayed with the coat-of-arms for your surname, hand-painted for a vibrant look that lasts for this generation and the next. 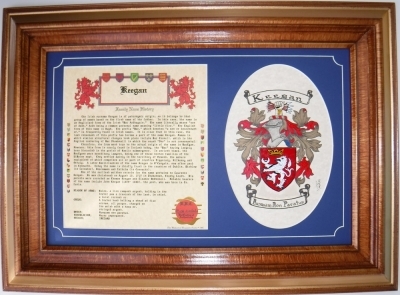 Each Gift Set includes a Family Name History and Hand-Painted Coat-of-Arms. Custom gilt-edged framing is accented with a linen inset, creating a masterpiece fit for home, business or castle. An in-depth look at the origins of your family surname, individually researched from authentic sources. Discover the origin of your family surname, its first recorded uses and other notable people who share that surname. 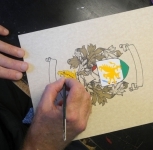 Each name history includes the Blazon of Arms—the written description of the coat-of-arms—which is then hand-painted alongside the family name history! Thousands of family name histories have been carefully researched on all nationalities—simply provide yours and let your history come to life. 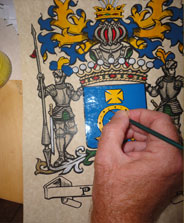 Premium parchment paper becomes the perfect canvas for your family history, as the authentic coat-of-arms for your family surname is painted by hand to exacting standards. Other retailers (who shall remain unnamed) market low-resolution computer printouts destined to disappoint. We ONLY provide genuine hand-painted artwork. 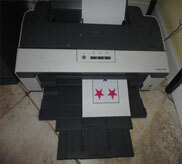 Simply provide the family surname at check out (and country of origin, if known), and we’ll do the rest. 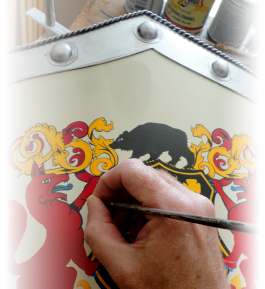 Each family coat-of-arms is carefully researched, then hand-painted by a master artist with durable oil-based enamels for vibrant color and lasting finish. 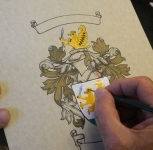 Family surname is hand-painted at the head scroll, while the family motto or country of origin is added to the base of the parchment for a lasting celebration of your family history. This Gift Set features custom matting that frames the Family Name History and Hand-Painted Parchment within—select from Blue or Green (below) for a look that readily complements your décor.